NIST scientist Jacob Ricker demonstrates how the encasement is elevated to a given angle. The document inside is a facsimile of the Preliminary Emancipation Proclamation. President Abraham Lincoln’s first handwritten draft of the Preliminary Emancipation Proclamation, a historic document in the collection of the New York State Library and New York State Education Department (NYSED), will soon be encased in a new high-tech “home.” Like so many of the nation’s most precious historical documents, including the Charters of Freedom, it will be protected by an encasement system custom-designed and constructed by NIST. The case, which is still being rigorously tested before final inspection by NYSED, is one of the first that NIST scientists have equipped with a 24/7 sensor monitoring system. The back of the encasement atop its cart. At the lower level are the monitoring electronics. The encasement is made from two halves that were precision milled from a solid block of aluminum and fit together in a sandwich configuration. “We started with about 690 pounds of metal,” says Mark Luce, Director of NIST's Fabrication Technology Group, “and cut away approximately 70%. One of the most critical aspects of the machining was the back of the Base component, which is about 3/32nds of an inch thick. It must be flexible to compensate for most of the changes in atmospheric pressure by bending in and out to alleviate strain on the glass. Inside the encasement, beneath the heavy two-pane laminated glass cover, the chamber is mostly filled with argon, an inert gas used, among other things, in old-fashioned incandescent light bulbs. Two large O-rings provide the seal between the two halves of the case. The integrity is tested by filling the case with helium and checking for leaks. 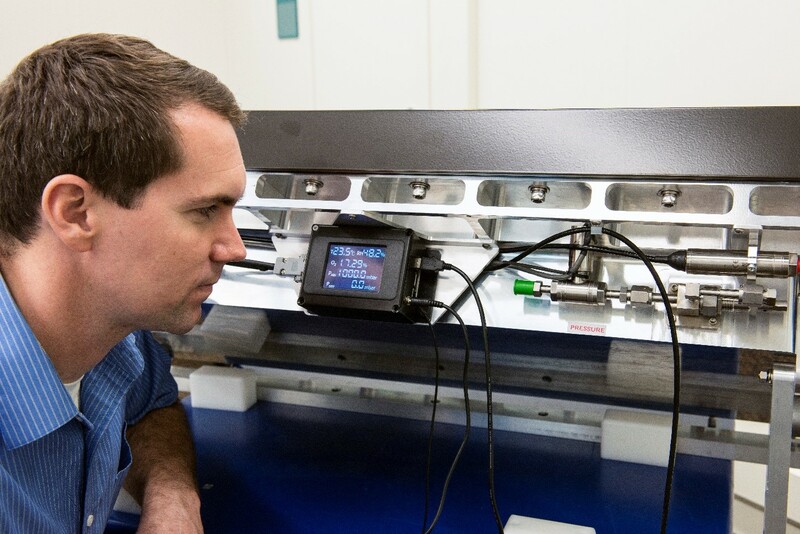 NIST scientist Jacob Ricker reading the sensor output display. The pressure sensor at right is one of several such instruments permanently mounted on the encasement. That’s why the array of sensors attached to the case include one port for instruments that measure oxygen levels. 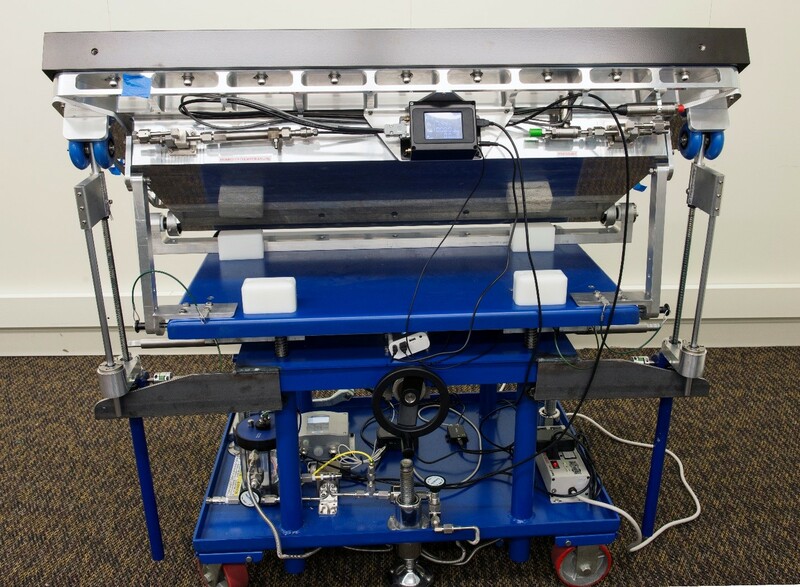 All the sensor output is routed to an onboard suite of electronics that sits on the bottom level of the cart NIST designed and constructed according to NYSED’s dimension requirements. Every other feature of the cart is designed for manual operation, including a hand crank that elevates the encasement to the desired viewing angle. * Iron gall ink, a very old formulation which was widely employed around the world well into the 20th century, is a combination of iron sulfate and the dark tannins extracted from galls that form on oak trees. It was in common use in America during Lincoln’s era.